ADK’s Professional Trails Crew is based at the Wiezel Trails Cabin (built with donated funds and volunteer labor in 1991), at Heart Lake Program Center. The crew currently works a 44-hour week, Friday – Wednesday morning with a mid-season break, and is broken into three of four crews. Heading into the woods on Friday, the crew packs into remote locations and sets up camp near the project site. Using hand tools and working both in teams and individually, the crew performs intensive trail reconstruction using primarily native materials. Tuesday afternoon the crew returns to the cabin and on Wednesday morning completes chores on the cabin, tools, equipment and vehicles. The regular season begins in early June and concludes later in August with the opportunity to stay on and work through the fall for those not returning to school or other commitments. This position is responsible for the entire crew and directly supervises the crew leaders during the day-to-day operation of the program. In addition, the Crew Boss is the direct link between the trails coordinator and subsequently the trails office. The Crew Boss has at least three (but typically more) seasons of proven leadership and trail skills. The Crew Boss sets the tone and acts as the “go-to” person for most of the crew’s needs. If the Crew Boss is the head of the crew, the Leaders are the backbone. Leaders make sure that expectations are met on projects and that crew members are not only pulling their weight, but also learning the necessary skills in the process. Leaders have at least two seasons of experience and are enthusiastic and committed to the program. The muscle of the program, crew members have from one to three seasons of trails experience and typically range in age from 16 to the 20s. Most are in college, some are juniors or seniors in high school, but all are looking for a physically and mentally demanding position for the summer. The Adirondacks is a unique and challenging place to learn trail skills. That being said, our members make the best leaders. On average, two-thirds of the crew returns each season, so it’s apparent that they enjoy their work. 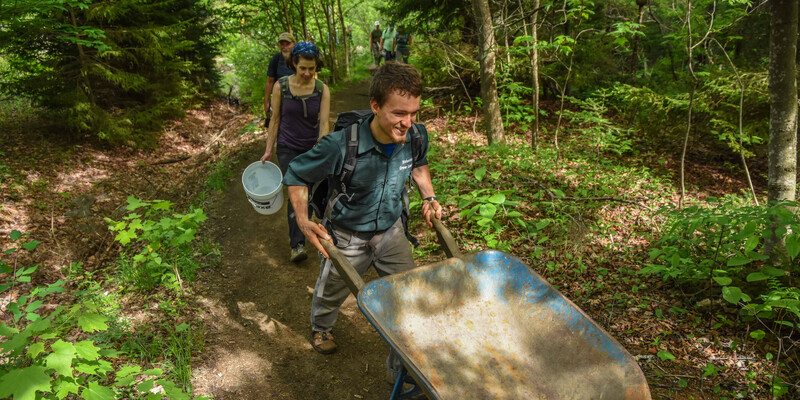 Many of our first year members have already been involved in our volunteer trails program or as a volunteer in other trails-related settings.